The Spokane Dodgers are an adult men's baseball team located in beautiful Spokane, Washington. As members of a national organization called the Men's Senior Baseball League (MSBL), we are fortunate to be able to continue playing the game we love, even though most of us are "over the hill." We play real baseball, not softball. We play on local high school and college baseball fields. Occasionally we get to play at Avista Stadium, home of the Spokane Indians professional baseball team. Feel free to browse our site, and if you would like to find out how you can join a team, send us an email. Note: We are not the Club Spokane Dodgers, an independent, select-level travel team for high school players. If you are looking for the Club Spokane Dodgers website, click here. The #2 seed Angels captured the 35+ championship by defeating the #1 seed Hawks to end a 9-year run by the Tigers. The #1 seed Tigers captured the 45+ championship by defeating the #2 seed Mariners at Shadle Park High School's Al K. Jackson Field. 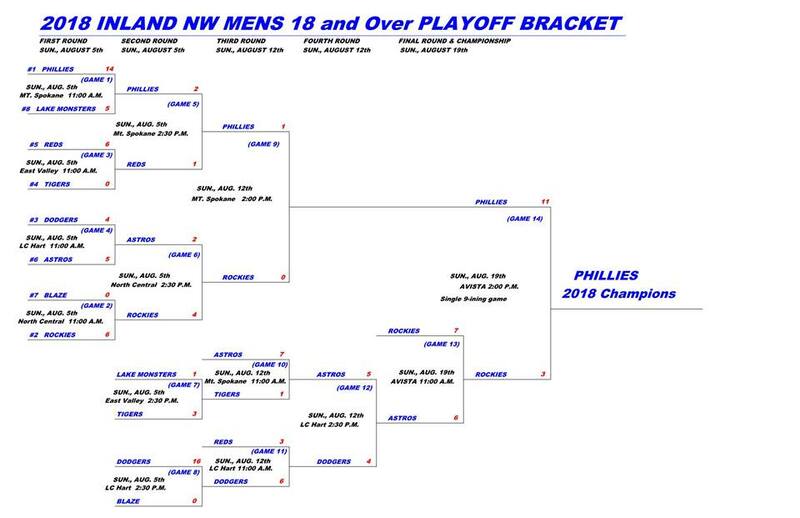 The #1 seed Phillies captured the 18+ championship by defeating the #2 seed Rockies at Avista Stadium. The Inland Northwest Men's Senior Baseball League is playing it's 23rd consecutive year of baseball this summer for adults 18 years and older in Spokane and surrounding communities. Drawing players from eastern Washington and northwest Idaho, the league will field three age-qualified divisions and over 200 players. In addition, the league will continue to play a short Fall season in September. This summer, the minimum ages for each division are 18 years, 35 years and 45 years. We welcome all ballplayers who have a desire to continue playing this great game, whatever your age. For more information, please visit the league website, or call 509.290.1491. Are you looking for a great baseball camp for your child? I highly recommend Premier Mitts, Inc., led by Kenny Eilmes. An infield specialist, he runs the only "infield only" baseball camp east of the cascades. Kenny and his expert staff take time to break down every aspect of infield play and pay close attention to the smallest of detail. Kenny is outstanding at teaching the higher level techniques and fundamentals and providing avenues for players to improve. For more information, visit the Premier Mitts website. By John Schlegel / MLB.com | 08/24/12 10:00 AM ET. ... And there he was Thursday night, making history. Again. Bill "Spaceman" Lee went back into orbit in a professional game at age 65, pitching where his baseball journey began that half-century ago in Marin County, across the Golden Gate Bridge from San Francisco at a field called Albert Park that's light years from the Majors. Lee not only became what's believed to be the oldest man to win a professional game on Thursday, but he went the distance for the San Rafael Pacifics in an independent North American League game against the Maui Na Koa Ikaika, earning the win and the everlasting adoration of the sellout crowd of 1,265. That's right, a complete-game victory in a crisp 2 hours and 21 minutes --- just like old times. Click here for the entire article at mlb.com. The GFI baseball tournament is a very prestigious wood bat tournament which has attracted many of the top semi-pro teams from North America, including the Seattle Studs, Houston Astros, Chicago Prairie Gravel, San Diego Stars, New York Storm and Trail Orioles. Each year Canada sends several college-based teams including the UBC T-Birds (Team Canada). In 2006, the San Diego Stars won their second GFI championship. The Spokane RiverHawks were represented by several current and former local college players. In addition, we were very fortunate to have Bill, Andy and Mike Lee join us for the tournament. Bill, a 119 game winner in his 14-year major league career with the Boston Red Sox and Montreal Expos, threw out the first pitch at the opening ceremony, making this a very special year for us. Bill also pitched 4 masterful innings in game 3 against Burnaby, giving up only 1 run. For more about the tournament, visit the GFI website.